There are four subspecies of gorillas around the world including, Mountain gorillas, eastern lowland type, western lowland and the cross river type. All gorilla species have been placed on the endangered list by the international union for conservation of nature (IUCN). There are about 800 of these remaining in the whole world, and 100.000 western gorillas also remain in the world, but their number are decreasing rapidly. The gorillas’ only natural predators in the wildlife is the leopard. This is the primarily main cause of gorillas’ extinction resulting from forest clearance and degradation, as the region’s population growth is at high rate. People have been cutting down the trees for finding where to live, firewood and even the land for agriculture, which led to varying degrees of deforestation. 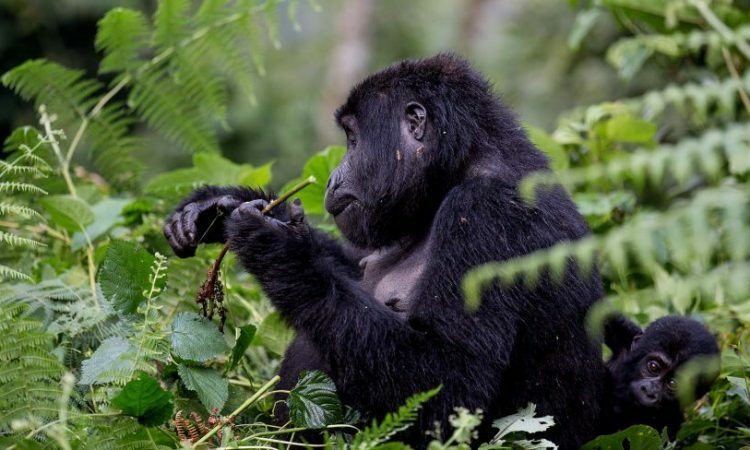 Also habitat loss and degradation can be resulting from the infrastructure development, possible disruption to mountain gorillas’ health and behavior are also emerging causes of their extinction as well as climate change. Bush meat trade and other illegal trade. Poaching of mountain gorillas for food is extremely rare. It is now the result of unselective hunting with snares which are set to catch antelopes, bush pigs and other wild animals but occasionally kill or injure them. Direct poaching or capture of babies for the live animal trade, remain one of the main causes of gorilla extinction, with an unfortunate incidences of poaching occurring throughout the mountain gorillas range in 2002, 2004 and 2007. These primates are closely related to the humans with similar anatomical and physical features. This makes them vulnerable to many of the same diseases, because they have not developed their necessary immunities. The exposure to an illness or virus that is relatively harmless to the humans, may devastate an entire population of gorillas live in the small groups that may not easily recover from a sudden fall numbers brought down by disease. For example: the outbreak of Ebola virus in 90s, which led to the death of some primates including gorillas. Some gorillas have already succumbed from common skin diseases like scabies and mange or respiratory diseases, which can quickly spread from one group to another as families interact. The civil unrest and conflict in the area, are an even present risk that impacting people and wild animals including gorillas. In general, weak institutional management structures, a feeling of disenfranchisement among local communities and insufficient of regional collaboration, insecurities, poor rules and laws protecting the wild animals are the serious challenges and a source of threats to the mountain gorillas.